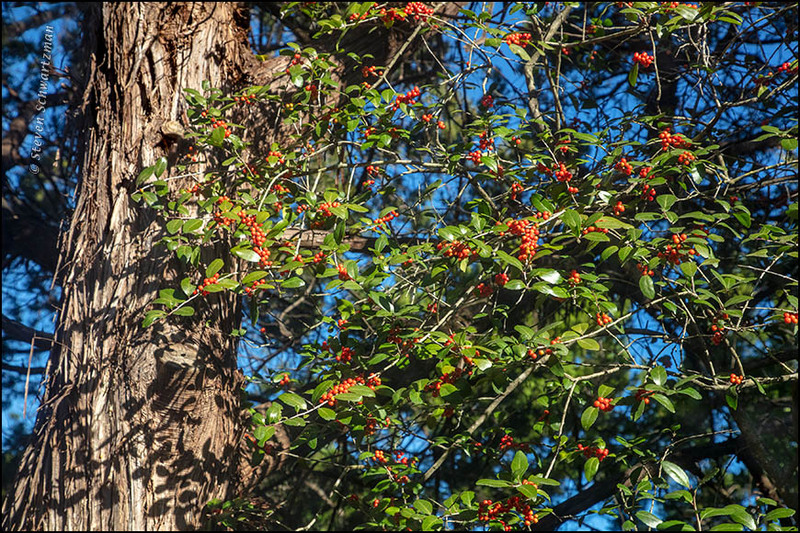 Behold a red and green yaupon holly (Ilex vomitoria) casting shadows onto the otherwise sunny trunk of an Ashe juniper tree (Juniperus ashei) on the morning of December 4th. You may remember from the beginning of this year a close-up of a squirrel biting off one of these little fruits from the same yaupon tree. That’s the first Cornish phrase I think I’ve ever encountered. Thanks, and the same to you. Thanks, and I hope you enjoyed your day. It’s a lovely view and a lovely photo that’s perfect for the season as well as for the day. I’m glad you linked to that photo of your squirrel, too. It’s one of my favorites, and in my opinion captures the very essence of squirrel. It occurred to me that the photo appeals for another reason: that nice distribution of red, green, and blue. And it occurs to me that the picture also symbolizes the RGB color system at work in the the monitors on which we’re looking at the picture. Call it self-referential. Speaking of squirrels on the Ashe juniper outside my window, I’ve mentioned over the years that they often scamper about and occasionally one will stare me down. Twice in the last week something new happened: a squirrel jumped from the tree trunk straight toward me and onto the window sill. There it moved about and sniffed as if looking for something, then soon jumped back to the tree and ran away. Both times I quickly grabbed the camera and took what few pictures I could, but they weren’t great, given the circumstances. Wow~nice view you have! I hope you and Eve had a merry Christmas. The view out that window as I write this shows light rain and some wind. You may envy the thermometer’s reading of 65°. Thanks for your good wishes, and the same back to you. We enjoyed a calm December 25th at home after having had maybe 15 people over for about five hours on December 23rd. Some of our guests came through the native plant connection and others through the Philippine connection, with one person indirectly falling into both categories, and another person into neither. That sounds like fun. I’ve always been far too shy to host a gathering, but I am beginning to think it would be fun to try. We are enjoying 50’s with a light drizzle, despite all the dire forecasts. Go for it! You’ve got nothing to lose except several loads in the dishwasher. It took till the third load two days later to finally get all the plates, bowls, and utensils washed and put away. Some people use paper plates and plastic utensils to cut way down on cleaning afterwards, but I like people to eat on/with the real thing. The dishwashing was much the same here but only 5 people were present for dinner. Messy cooks, methinks. One factor is that when our visitors departed they carried away with them the bowls in which they’d brought their contributions. As a result, our cleaning burden was a lot less than if everything had been prepared here. Wonderful photo of the festive yaupon tree, Steve. Best wishes for a new year filled with beauty and color. Festive indeed, Jet. That’s the view out my window for some three or four months of the year, from the time the fruit ripens to the time it falls off or gets eaten. It’s a good emblem for the ending of the old year and the launch into the new one. As long as nature exists, it will bring us beauty and color. Very apropos, Steve. I hope you are enjoying this festive season. From a full house here on the 23rd through quiet at home since then (except for two hours photographing in nature yesterday morning), yes, we’re enjoying it. Thanks. If there’s no more rain here tomorrow and things dry out enough, we’ll go back out into the world. How cool. Two of the more traditional American natives in one spot (although I think that Eastern red cedar is more traditional than Ashe juniper . . . in other regions). oh wait, that’s yaupon, not Ilex opaca. duh. I should have caught that. I don’t see it often enough to remember the name, and I would not recognize it if I saw it again. This is the native central Texas incarnation of what you had in mind. I have not seen Ilex opace since the late 1980s when I was still in school. Compact yaupon is used in landscapes here, but probably shouldn’t be. It never looks good. I happen to like the hollies, but some do not do well, and ‘gardeners’ ruin the rest. It was then, and even a few days ago. As I write this, however, I look out the window at gloom and drizzle, and the outside thermometer reads 40°F (4°C). To things that are piratical.